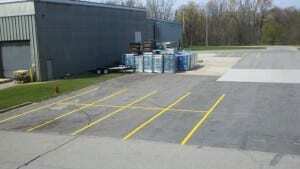 Parking lot striping Contractors since 2009. 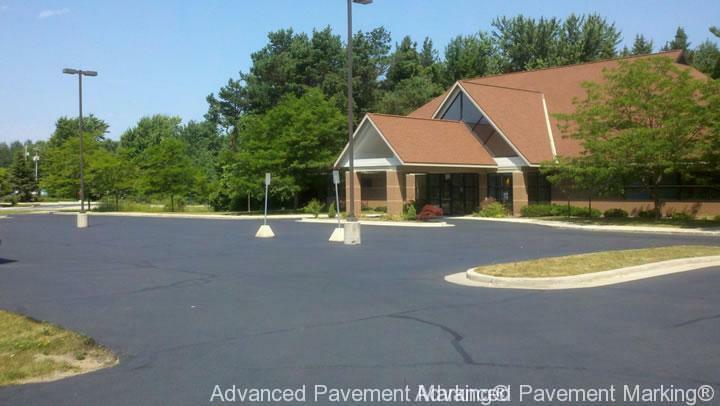 Servicing projects of all sizes throughout Michigan, Ohio, Indiana and Illinois. 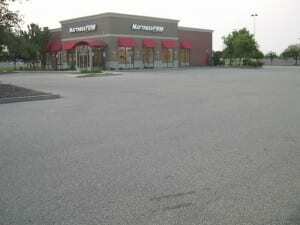 Safety hazards, positive first impressions, organization, smooth traffic flow and accessibility. 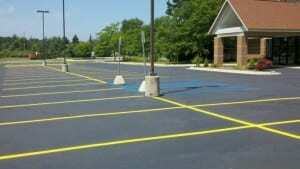 Parking lot striping has more meaning than just curb appeal and color! Parking lot markings have a very specific purpose and must be professionally maintained. 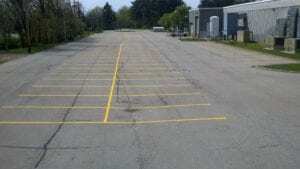 What does a professionally striped parking lot actually mean? For visitors: A well marked parking lot is inviting, visually informative, well thought out with traffic flow and pedestrian interaction and should be minimally stress free and provide ample ADA accessibility. A parking lot is not only where first impressions happen but also the place last ones are created. 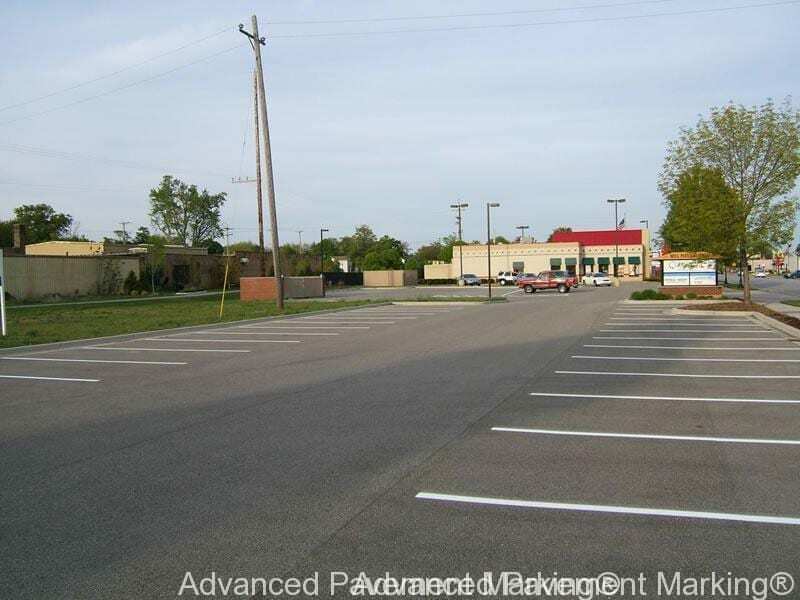 For the parking lot owner: Maintained parking lot markings have a positive influence on visitors and helps reduce chances of insurance/litigation claims for automobile, pedestrian and ADA incidents. Proper traffic flow, parking spaces, pedestrian crossings, ADA accessibility, Fire lanes and other identified safety-information zones must be maintained. Dull markings, poorly measured spaces, missing ADA zones and pedestrian crossings even chaotic traffic flow for entering and exiting visitors creates real issues for potential customers. 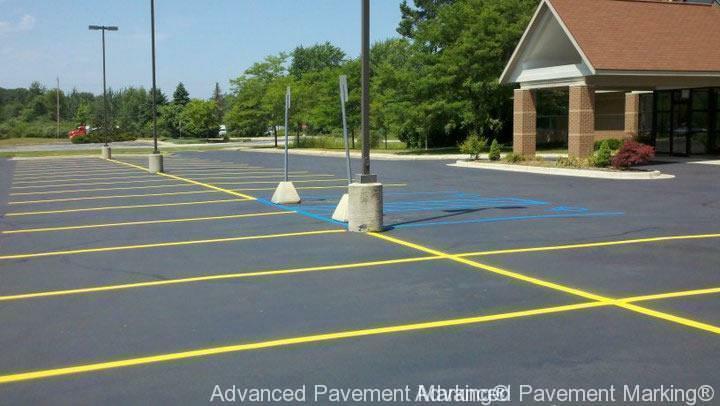 APM offers a wide range of parking lot services including: design, layout, installation and restriping. From small parking lots to large scale malls and city wide projects our team has the experience, equipment and materials to service them all. 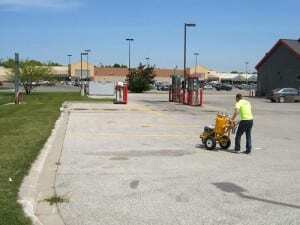 Inside parking lot striping: Anyone can purchase and operate a parking line striper, but it takes an experienced professional to do the job right. 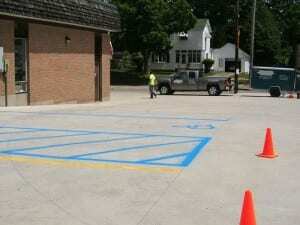 Parking lot painting requires several steps that all must be done correctly in order for it to be useful and looking professional. 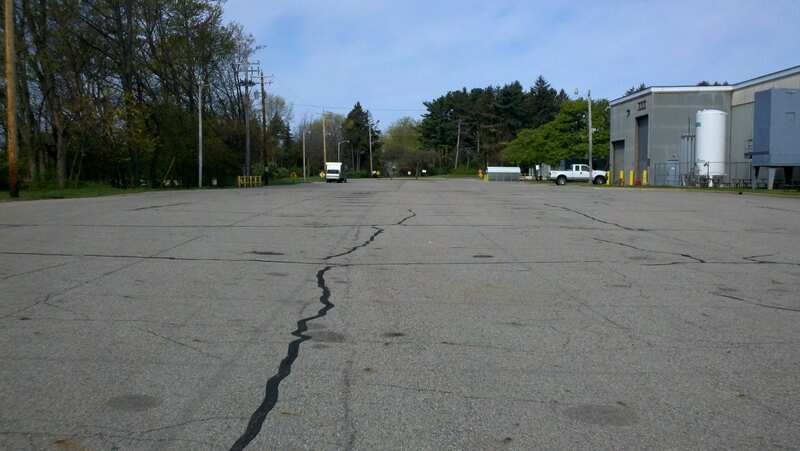 From entering and exiting traffic flow, proper vehicle spacing for parking to clearly identifying designated safety zones and crossings there are several reasons to have us involved in your project. Our highly trained crews will ensure not only a great looking job but also one that will have a longer service life. 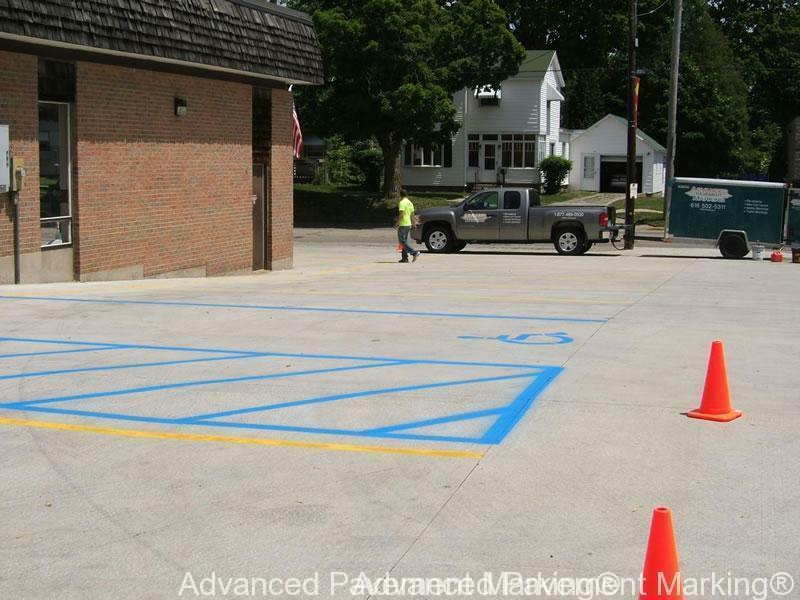 Paint: Our professional application machines accurately and consistently install all markings to industry standards. Clean, straight lines with the proper paint thickness makes our line striping work look professional and have the long lasting durability clients deserve. 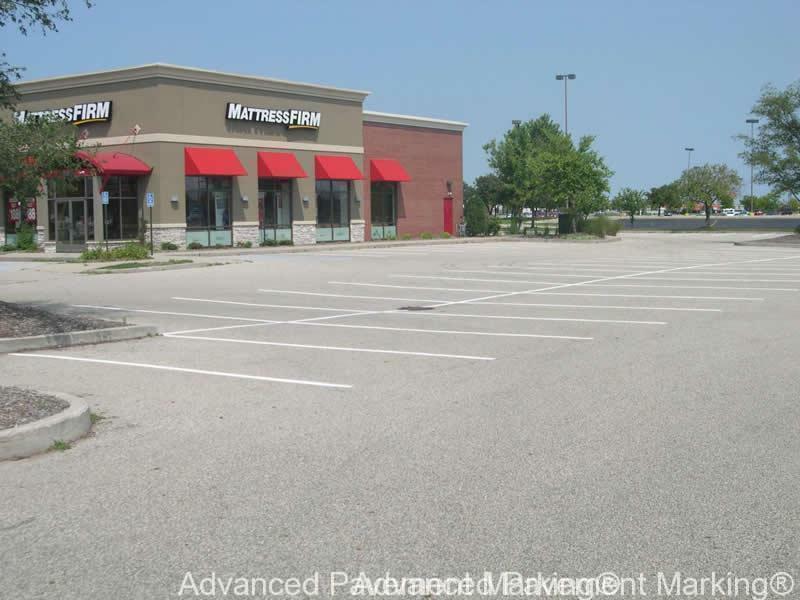 Equipment: Our machines of choice is not at the same level as a typical parking lot painter and there is a reason for this. We service large scale projects that require heavy duty production, and application standards that MUST MEET INSPECTION STANDARDS. 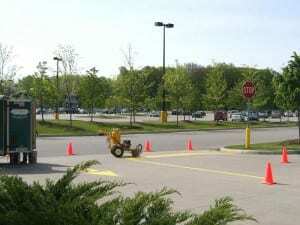 We are contracted to service: airports, roads, racetracks even indoor markings across the USA. Our machines are purpose built or selected for professional results and performance. APM invests heavily into the best PROVEN machines and materials, we do not cut corners period. 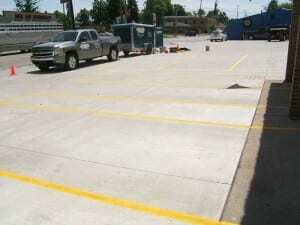 Why hire us for your parking lot project? Our extensive portfolio and clientele speaks volumes of our experience, quality and project durability. APM crews are true craftsmen and women who are passionate with their work. 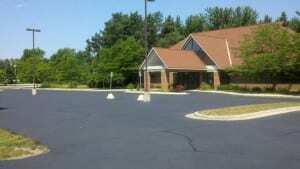 Cities, Counties, Airports, Federal Government including the USA Military and more all contract our pavement marking and line striping services. Our materials and equipment are made for professional results. Compare us to the competition and you will learn that; We are the difference you can see, with the quality and durability you can trust! Parking lot striping, painting airports, roads, racetracks, warehouses and more, we are the pavement marking professionals since 2009. 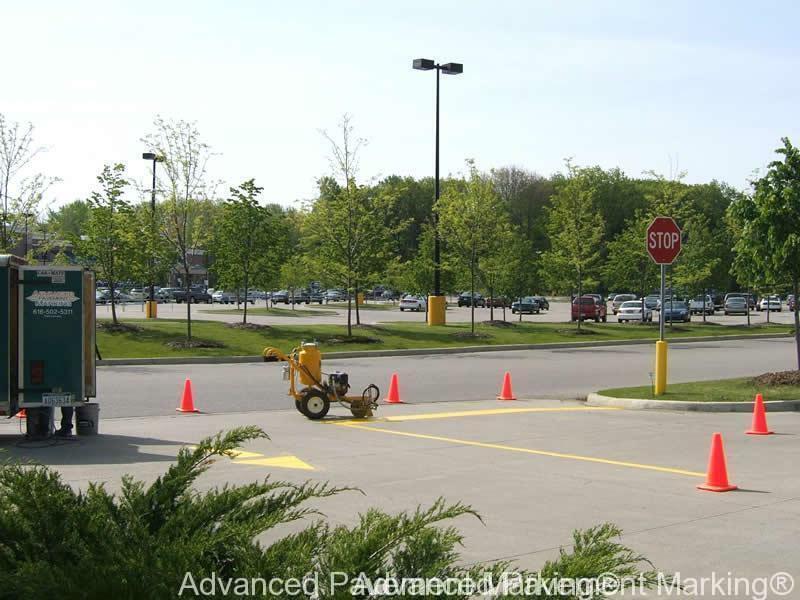 Since 2009 Advanced Pavement Marking has been parking lot striping, painting airports, roads, racetracks, warehouses and more. We are the Professionals your project deserves! Did you know we service all of the United States? !